I was delighted to receive a visual representation of our March session at Coaching Connections – a flyer showing what the session will include, what it will look and feel like. I reflected on how Anna Geyer, who is delivering the session had used an effective way to get her message across about “The Power of Visual Coaching Techniques”. I often have conversations with fellow coaches at Coaching Connections about the ways in which we market our services and grow our businesses. – know your target audience and find ways to communicate your message to them. Make sure your networking and communications are focused. Build up a niche offer for your target group, and understand what problems you are solving for them. – encourage word of mouth referrals. When you have one satisfied client, it can be a stepping stone to getting repeat business and referrals. – understand your value proposition, this is linked to the first point of knowing your target audience. It is important to know what they value and what problems you are solving for them. They don’t particularly need to know all the details of how you coach, they need to know the benefits it will bring to them. – have a good visual and verbal communication. This takes us back to Anna’s flyer, which is visually engaging and gets her message across. It makes me want to go to her session on March 8th. In addition to a website, a flyer, a brochure, make sure you have a short introduction to your business ready to share when you meet prospective clients in networking situations. This is often referred to as the elevator pitch. Coming up in Coaching Connections meetings we will have the opportunity to focus on the marketing of our coaching businesses. For example in April we will be having group discussions facilitated by the Pickleshed and we will invite members to explore if they wish the topic of business development and effective marketing in their coaching groups. The power of peer conversations is one of the key benefits of coming to Coaching Connections. In April we will experience the power of group coaching, structuring conversations for the benefit of each individual in the group. 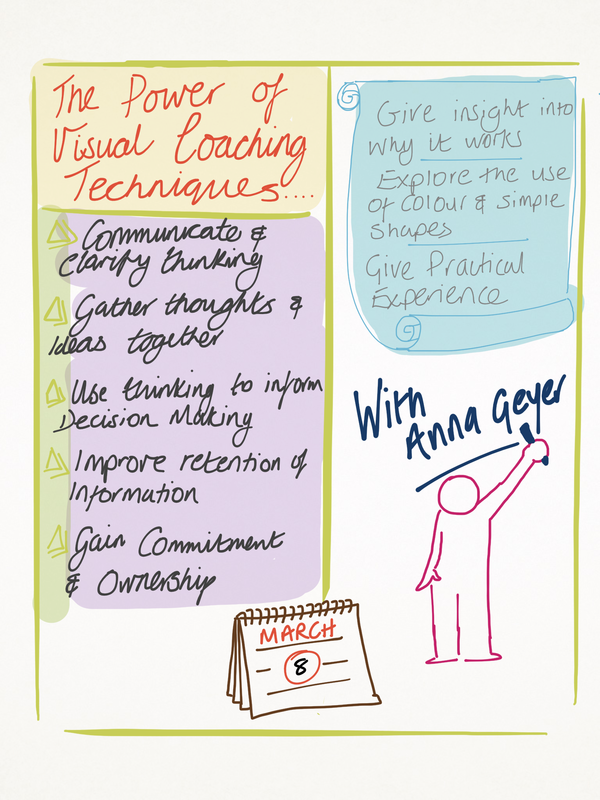 To find out more about the “Power of Visual Coaching Techniques” on 8 March go to http://www.coachingconnectionsmidlands.co.uk. Details of the 12 April meeting “Group coaching in action” will be available soon. Any questions, tips or thoughts about how coaches and portfolio careerists attract customers, do share your comments or questions on this blog.